Who Knew Vegan Peanut Butter Cups Were so Easy to Make? 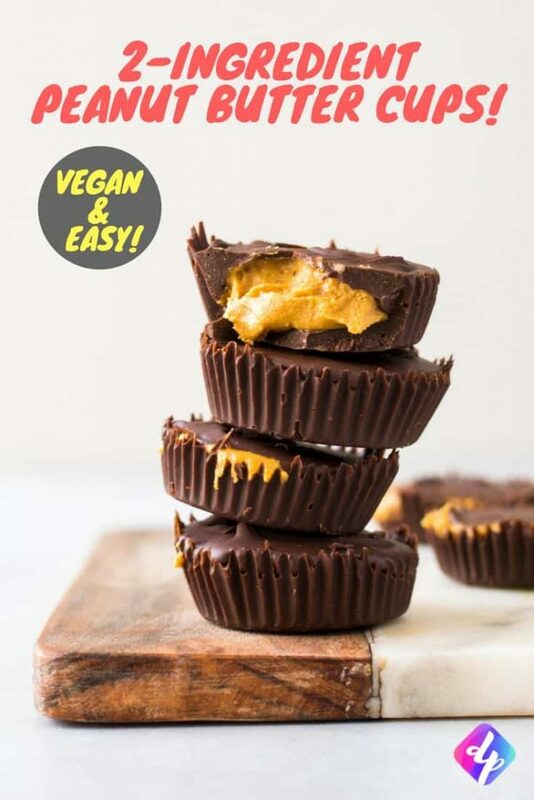 When we first went vegan over two years ago we tried to find an easy recipe for vegan peanut butter cups but the first one we found probably used over 15 ingredients and took way too long to put together! I’m sure they tasted great and all but we just wanted something easy! Since then we have been plagued by this thought that making vegan peanut butter cups was going to be such a mission that we never even tried to find another recipe. Enter 2-Ingredient Vegan Peanut Butter Cups! Last week we decided enough was enough and made these 2-ingredient vegan peanut butter cups without any unnecessary ingredients, complicated instructions and long waiting times. I mean, who has time to wait for peanut butter cups? 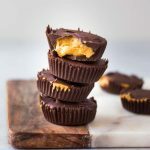 These vegan peanut butter cups are crunchy and creamy but super quick and easy to make! The combination of chocolate and peanut butter works beautifully together and they only take 20 minutes from start to finish! Making your own homemade sweet treats is great but they’re sometimes so great that unfortunately they never last long enough! This recipe makes roughly 6 peanut butter cups (depending on how heavy handed you are with the chocolate!) so we always double, or even triple, the recipe so that at least we have some sweet treats for the next few days. This helps us to eat less unhealthy processed snacks during the week and opt for a homemade vegan peanut butter cup instead! 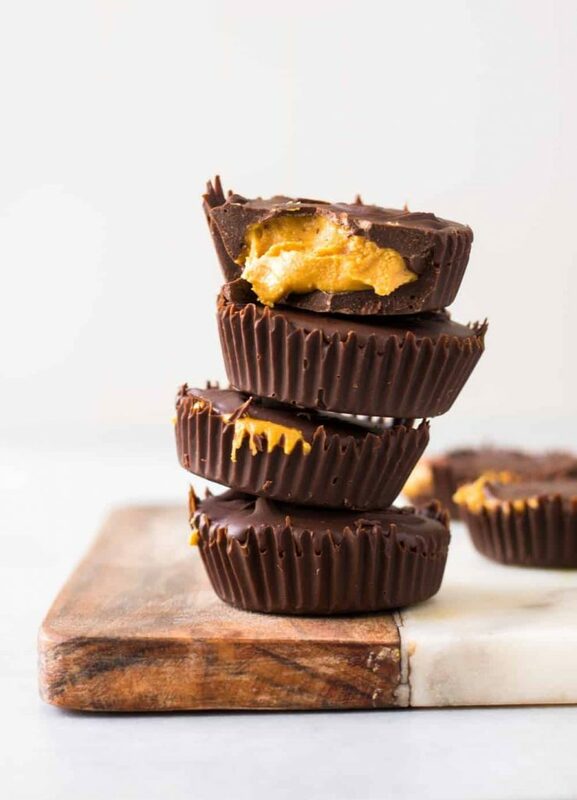 These vegan peanut butter cups are crunchy and creamy but super quick and easy to make! 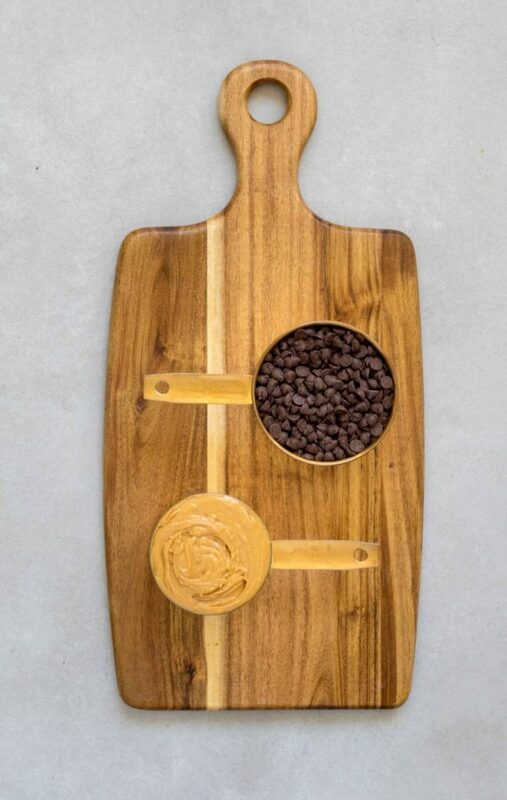 The combination of chocolate and peanut butter works beautifully together and they only take 2-ingredients and 20 minutes from start to finish! Place 6 muffin papers into a muffin tray and set aside. Heat water in a saucepan over medium heat and melt the chocolate chips in a double boiler until they are smooth and no lumps remain. Set aside to cool. Divide half of the melted chocolate between the 6 muffin papers. Using a spoon, spread the chocolate mixture evenly over the bottom and up the sides of the muffin papers. Keep spreading the chocolate until it solidifies slightly and starts to stick to the sides of the muffin paper without sliding down. Cover and chill for 10 minutes. Once the bases have chilled, divide and spoon the peanut butter into the 6 muffin papers and smooth over with a spoon. Finally, cover the peanut butter with the rest of the melted chocolate, cover and chill for another 10 minutes. Once they have fully set, remove the peanut butter cups from the wrappers and enjoy! These peanut butter cups can be stored in the refrigerator, covered, for up to a week. Have you ever made peanut butter cups before? Let me know in the comments below, I would love to hear from you!